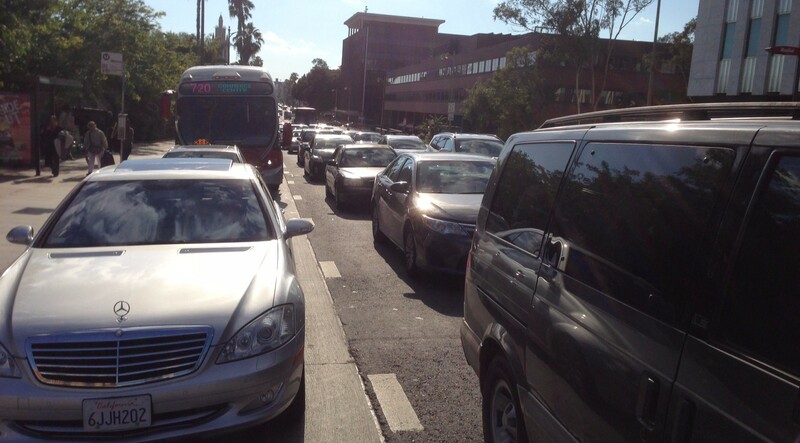 Illegally parked car blocks the Wilshire BRT peak-hour bus lane last Friday. All photos by Joe Linton/Streetsblog L.A.
On April 8, Los Angeles Mayor Eric Garcetti and other Metro, federal, county, and city leaders cut the ceremonial ribbon opening the second phase of the $31.5 million Wilshire BRT (Bus Rapid Transit). Metro forecasted that the Wilshire Boulevard peak-hour bus-only lanes will significantly improve commute times for the more than 25,000 people who board Wilshire Boulevard buses at peak hours every weekday. But those improvements will only materialize when the bus-only lanes only have buses in them. Unfortunately, many peak-hour drivers are breaking the law by driving in the exclusive bus lanes. This Mercedes with license plate 6JJH202 is blocking the Metro 720 bus from getting to the Crenshaw Blvd stop. That car and the one behind it followed me through the intersection, ignoring the right-turn-only designation for cars in their lane. Last Friday from 4:30 p.m. to 5:30 p.m., I observed hundreds of drivers breaking traffic laws, most of them driving straight ahead through right-turn-only designated intersections, but also two cars illegally parked in the designated “anti-gridlock” tow-away no-parking lane. I observed dozens of these cars clearly impeding the progress of the very frequent Wilshire buses. The majority of drivers did respect and stay out of the bus-only lane. Signage on Wilshire designates right turn only during peak commute hours. I stopped at a handful of intersections, and every time observed multiple cars breaking laws by proceeding straight ahead through right-turn-only intersections. Both rapid and local Wilshire buses were arrive very frequently at the peak commute hour, though, between buses, there was still often a one or two-minute space that law-breaking drivers file into. I uploaded four videos showing numerous peak-hour right turn violations–see above, and here, here, and here. This situation is as much of a proverbial fish-in-a-barrel (to use the L.A. Times‘ description) enforcement opportunity as LAPD’s ill-advised downtown pedestrian ticketing. It seems that a few LAPD motorcycle officers patrolling these lanes at morning and evening rush hours could easily write dozens of right turn violation tickets. After some police enforcement, the word would likely get out, and drivers would stay out of the lane, benefiting the commute times for the tens of thousands of Wilshire bus riders. SBLA will make inquiries to LAPD and find out how LAPD bus-only lane enforcement activity has been proceeding. The first phase of the bus lanes opened in June 2013, so, for some stretches, there should be a couple years’ worth of enforcement records. In my observations of the Metro Silver Line BRT running on freeway ExpressLanes, a visible traffic enforcement presence has helped ensure that errant drivers do not get in the way of that BRT project’s success. For my (admittedly small) sample last Friday, I saw no traffic enforcement on Wilshire Boulevard. Other cities, notably New York and San Francisco, use on-bus traffic cameras to enforce driver compliance with bus-only lane laws; these cities do still experience some issues with scofflaw drivers impeding transit. Maybe Metro can look into a similar camera programs to ensure that Los Angeles’ Wilshire BRT delivers the ridership benefits projected.